E, 2012/11/26, 09:35:41.787, Microsoft.VisualStudio.TestTools.WebStress.LoadTestException: An error occurred while attempting to create the load test results repository schema: Could not find stored procedure 'sp_dboption'. Could not find stored procedure 'sp_dboption'. Then I looked for the corresponding VS 2012 script on a different machine at C:\Program Files (x86)\Microsoft Visual Studio 11.0\Common7\IDE\loadtestresultsrepository.sql which worked. A huge benefit of using Selenium is that you don’t need an interactive desktop session to run the automated UI tests. If you see the error Class Initialization method Selenium.IETests.MyClassInitialize threw exception. System.InvalidOperationException: System.InvalidOperationException: Unexpected error launching Internet Explorer. Protected Mode settings are not the same for all zones. Enable Protected Mode must be set to the same value (enabled or disabled) for all zones. (NoSuchDriver). Or enable Protected Mode setting for all zones. Go to Tools->Internet Option->Security and check “Enable Protected Mode” for all zones. Automated UI testing needs to be performed from different parts of the world. 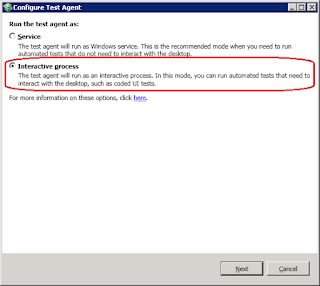 As we have seen in my previous post on Performance testing using the power of cloud, it is possible to install test agents around the globe and run Load Tests from the agents. The same setup can be used to run unit tests or web tests by distributing them across different agents. The challenging part is to run UI tests (e.g. Coded UI) from the agents in cloud. This is because we will always need to have an active desktop session for the tests to interact with the UI. One option would be to have dedicated hardware on premise from where active remote desktop session is always maintained for all the agents in the cloud. The other option is to tweak the configuration a little as described below without requiring any additional hardware. Perform the same steps which were done for the setting up the environment to run load tests i.e. 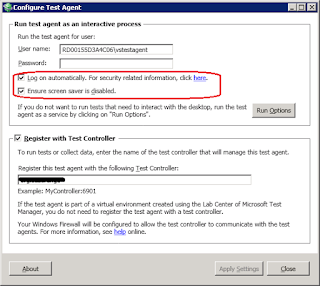 Installing Test Controller on Premise and Setting up Windows Azure Connect. Instead of having just one user on the Azure VM’s, we will need to have two users. One of them is used for Remote Desktop and the other one is used to Run Tests. Deploy the worker role and add it to the Local Endpoint Group for Windows Azure Connect as before. Now Remote Desktop to the Azure VM from the Azure Portal using the Remote Desktop user. Once connected, get the machine name of the VM from Computer->Properties. Go to Run and type mstsc and connect to the same VM using the machine name. 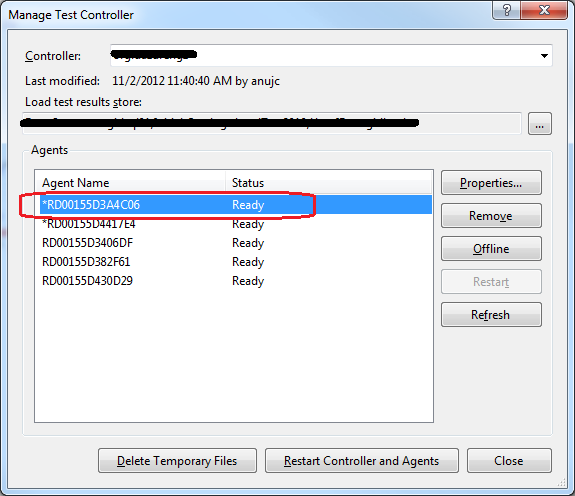 While connecting this time, type the credentials of the Test Agent user. 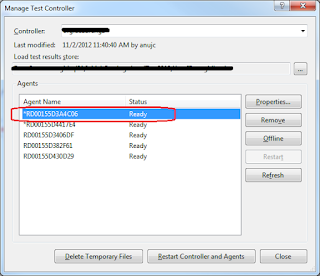 Configure the test agent with the test controller in Interactive mode. Now don’t minimize any remote desktop windows and simply close the remote desktop window of the Remote Desktop user. 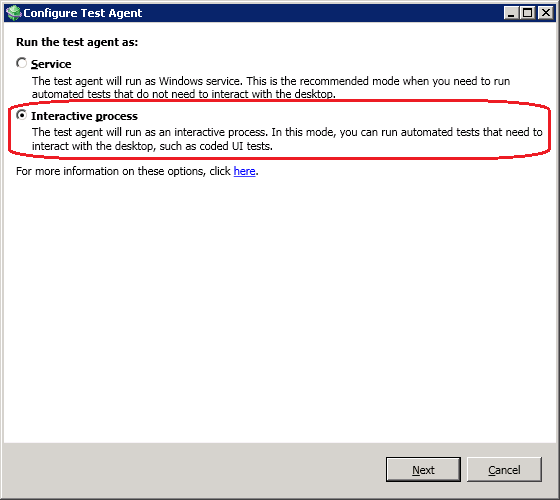 This way the Remote Desktop window of the Test Agent user will be always active and the UI Tests can interact with the desktop. To confirm that the desktop doesn’t get locked, wait for 10-15 minutes, rerun the automated UI test and verify that it passes. I came across a situation where I needed to generate a TRX file dynamically for a set of tests. This TRX would then to be used to rerun the set of tests. Now you are ready to run the tests from the TRX. 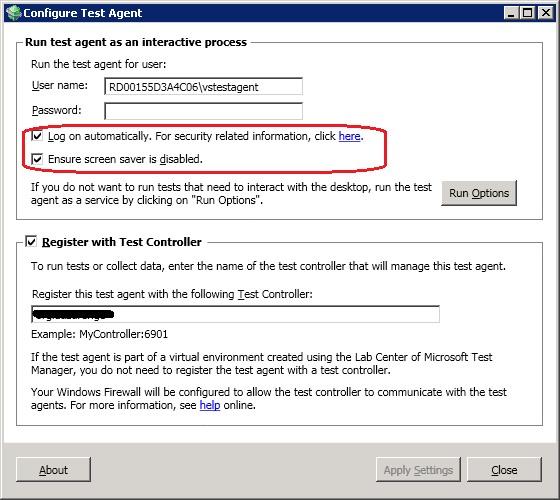 The only thing to note is that while running the tests from the Test Results window, don’t check any test. Just click Run and Enjoy!